SWECO has developed a new rectangular separator that can adapt as solids characteristics change. Combining the patented elliptical motion with linear motion technology, SWECO has created the Multi-Motion (MM) Rectangular Separator, a revolutionary separator that delivers the benefits of two distinct motions. The MM offers an attachment that can continuously or intermittently wash screen mesh free of solids. Screen blinding is a major cause of reduced capacity, and systems like the traveling spray will enable your shaker to perform more efficiently by assuring maximum throughput. The unique Universal Motion Rectangular separator allows the user to precisely dial in the ideal motion for each application. Until this latest SWECO UM innovation, completely different machines were necessary for such drastic motion changes. Round, balanced elliptical and linear motion are now simple field adjustments. The SWECO Paper Coating Rectangular Shaker can filter “slurried coating ingredients”, “blended virgin coatings”, and “return coatings” containing fiber contaminants. With the ability to remove grit and fiber, the SWECO Paper Coating Separator reduces the chances of scratches and other defects in your coated papers. SWECO offers three sound options for a separation process in the Pulp & Paper Industry – the RM-CIP, UM-CIP and V3-CIP Rectangular Separators. The UM-CIP can be customized to your process to produce either round, elliptical or linear motion through a series of mechanical adjustments. This model produces more amplitude than any of SWECO’s other Rectangular Shakers, producing a better conveyance to maximize that machine’s throughput. Furthermore, in addition to its three-panel model, the UM-CIP comes in a four-panel design that increases the active screen surface by 33%. The V3 offers both elliptical and linear motion with just a flip of a switch. Both motions provide benefits, but primarily linear motion offers superior solids conveyance, and elliptical motion generates a much gentler motion and provides excellent screen life. Benefits of the V3 include few moving parts requiring little maintenance, easy screen changes, adjustable deck angle, clean and compact interior and a sanitary design. The V3-CIP can be tailored to your process to produce either elliptical or linear motion. The high g-force produced by the patented drive allows for better conveyance and higher throughputs. The CIP features and modular design make the V3-CIP very easy to clean between production runs, and the machine can be polished to eliminate crevices where material tends to get trapped. The hinged cover makes changing screens easier than any other rectangular separator design. 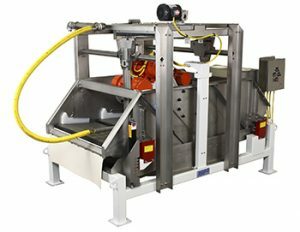 The SWECO Round Motion (RM) Rectangular Shaker’s highly-efficient round motion conveying action is created by a two-bearing vibratory system, designed to run at 1000-2200 RPM, producing up to 3-½ Gs acceleration. Its effectiveness is maximized when inclined for dry screening or for horizontal wet scalping of slurries with a low percentage of oversized products. Good classification is also consistently achieved as the RM “tumbles and rolls” dry solids. The SWECO GyraMax is yet another separation solution to further optimize your facilities’ production. The GyraMax Gyratory Sifter maximizes productivity, provides maximum vibration control and enables maximum recovery of clean, acceptable product. The GyraMax can increase your plant’s productivity by reducing the costs associated with routine maintenance and unscheduled repairs. That means fewer production outages and fewer instances of pulling employees away from other duties for unscheduled maintenance. It all adds up to less frustration, greater productivity, and lower production costs.